...So, I have this large Pavlovo Posad shawl that I adore - Fairytale by Sukharevskaya (шаль "Сказка", художник Сухаревская). It is in my favourite colours, it has a lovely intricate print, it is huge and silky to the touch and warm... my Precious! 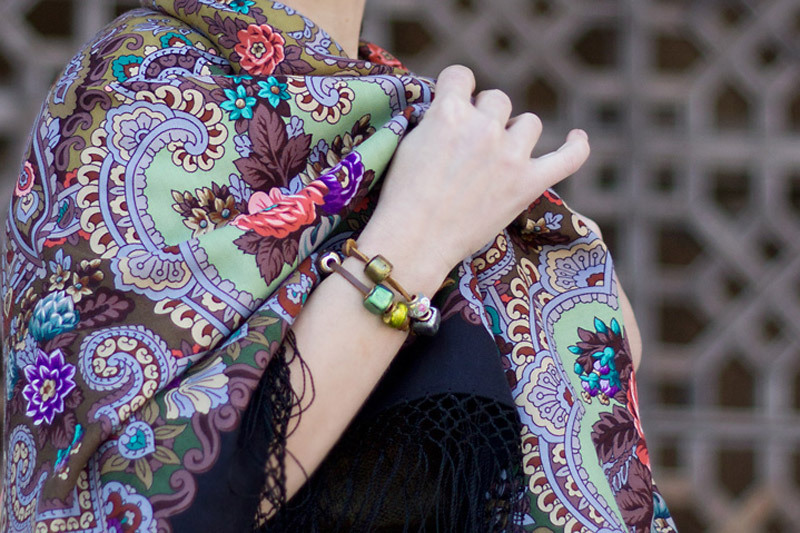 I love it so much, I decided that I needed a bracelet specifically for this shawl. I am sure you can understand. 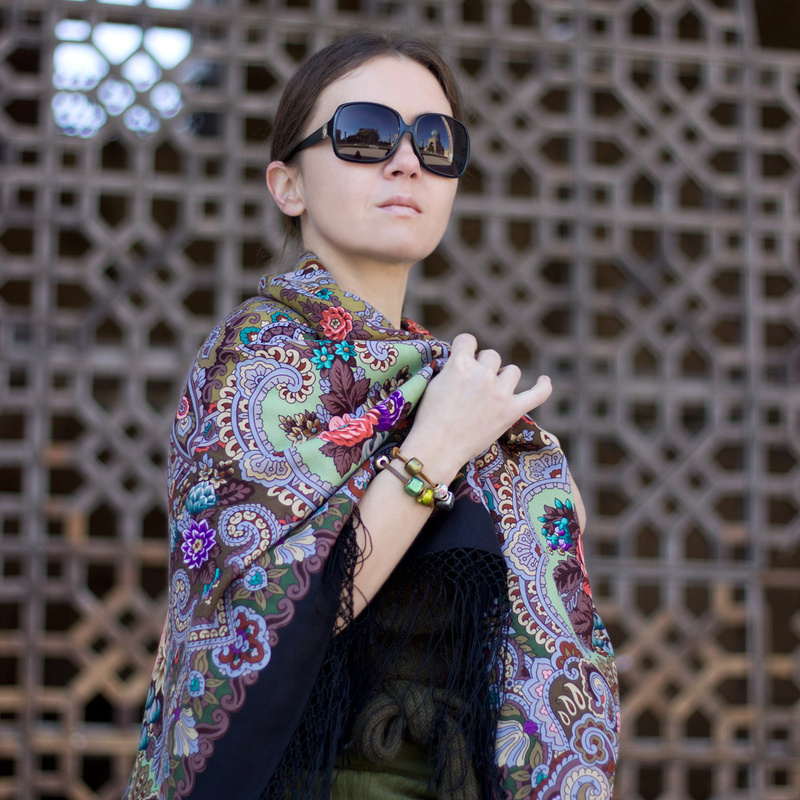 This is me and Fairytale in Samarkand during the last weekend; a Russian shawl is a perfect travelling companion. You wear it when you are cold, and when it is too warm, you just fold it and put away in your bag, as it is so compact. And can you see that bracelet? I feel that I could hardly find anything better suited for this shawl. I do not wear costume jewelry, but I cannot afford to buy emeralds and tourmalines in the size I would love to have for the shawl. However, I feel that murano glass with vermeil cores (that is gold over sterling) is jewelry enough, and this bracelet definitely suits my needs. I must admit, I am very proud of how clever I was when I bought these beads. I was thinking about some Chamilia or Pandora charms, but I must admit that their glass beads are too expensive for me. And then I found these Perlavita beads here. There was a discount, so I bought six beads, most were about 5$, and only the 'wedding cake' bead - the one with painted flowers, it is called Serenissima on the website - was 14$. But I felt that I had to have it. I was a bit confused when I received the beads (expertly packed, in perfect order, and there was a small gift, too). They are lovely, but rather large and cannot be combined with my Pandora, as I planned to do. They fit on Pandora and Chamilia bracelets, but look too bulky. However, I decided to wear them on their own, for which they are perfectly suited, and put them on the leather cord, to wear wrap style. When I look at this, I am in aesthetic heaven. I think they look very festive, and provide the much needed splash of colour in the gloomy days of late autumn. I love the effect of foil under coloured glass, and I love the depth and richness of colour. To me, Venetian glass is as precious as gemstones. 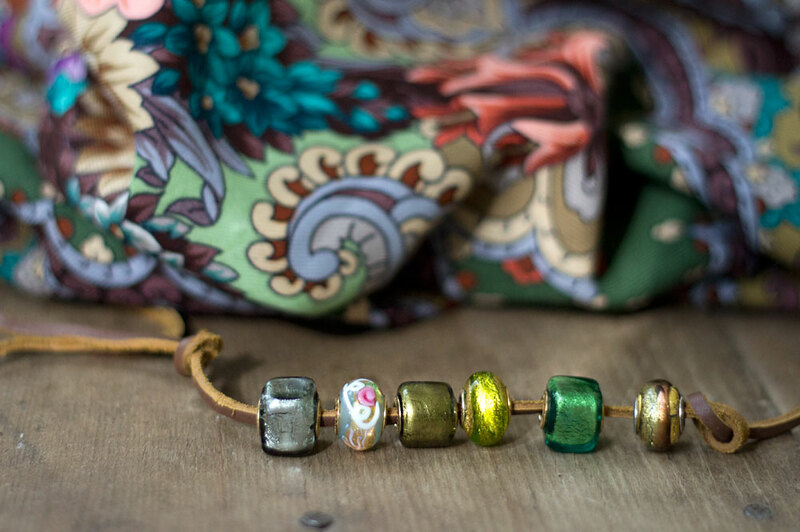 I do not wear plastic, as it is not jewellery to me, but Perlavita murano beads are very much jewellery - a real treasure. And now I hope there will be a discount for the Serenissima beads, too, as I would love to have several more. I bought Chamilia teardrop earrings where you can put different beads, so I definitely need more beads! Eugenie, you look stunning in the shawl! 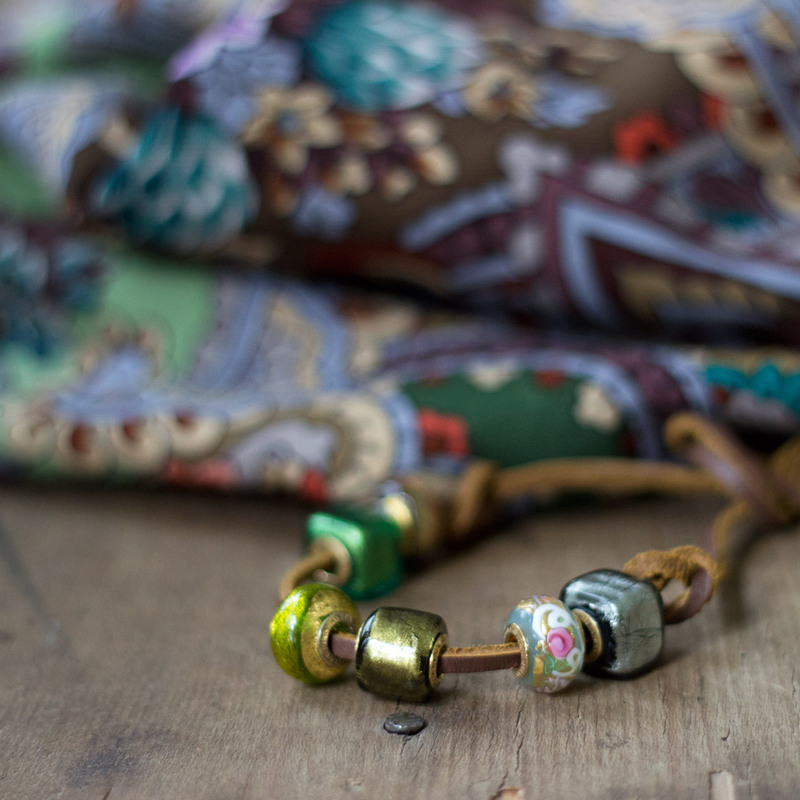 The bracelet has a lovely boho feel. I know of Pandora beads, but haven't heard of Perlavita. Great photos!!! Отличное фото :) Очень красиво подобраны цвета, шали и бусинок.